It's time for the second Annual Christmas Card Carousel. My good friend Faith started this last year and I had SO much fun going and looking at all my bloggy friend's Christmas Cards. I am so excited to share our card with all of my friends. Here is our 2009 Christmas Card! In case its hard to read it says: Oh by golly have a holly jolly Christmas! I ordered our card through Notably Noted, and I was beyond pleased with the result. If you have any card/stationary needs you should check them out. Seriously, it is CUTE stuff! Merry Christmas from The Tree's! Head over to Faith's blog to join in on the fun! Thanks so much for joining in the fun! Merry CHRISTmas to you my sweet friend!!! I've never heard of Notably Noted... I will have to check them out next year! I tagged you! Get your award off of my blog! So darling - I especially love the argyle! Love the card! So adorable & the argyle is fab! 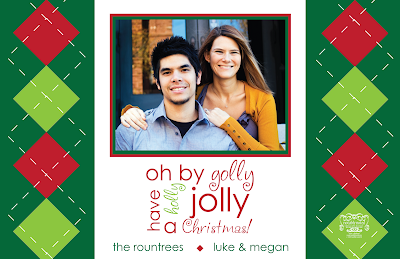 Love your Christmas card Megan!! Love the colors and the design!! You are so gorgeous!! Merry Christmas friend! Aw that card turned out amazingly!! Beautiful card and I love the website. Thanks for sharing. Love it! Ya'll are such a cute couple! I hope your Christmas is fabulous! Your card is soooo cute and so how I picture you ~~ argyle ~~ LOVE IT!!!!! How cute! Love your blog! LOVE yall's card!!! SO cute!!! ....and I love yours too!!! The argyle is great! You two are a great looking couple!! I LOVE your card! :-) so fun!